Tough on the outside but soft on the inside, Cancer the Crab is a sensitive sign that cares deeply about others. Tenaciously loyal and loving, Cancers are the nurturers of the zodiac, and will fiercely protect themselves and anything they hold dear. They are lovers not fighters, but will always fight for who they love. Embodied by the Crab’s hard shell, Cancer prizes comfort, security, and protection. This sign is connected to the grace and ferocity of motherhood, making them both emotional and intuitive, and highly influenced by subconscious thought and feeling. Cancer birthstone: Moonstone. This magical gemstone is, not surprisingly, associated with the Moon, Cancer's planetary ruler. 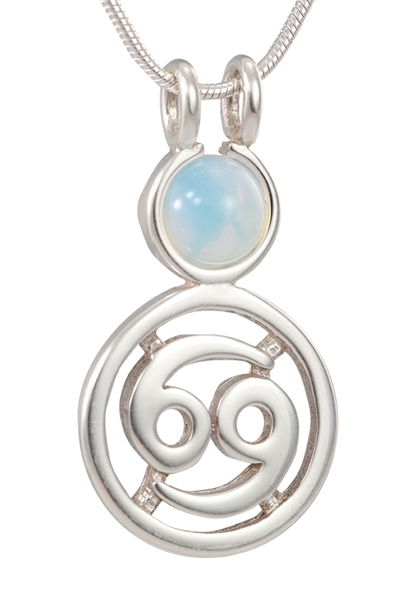 Moonstone is said to absorb the healing power of the Moon, and the most powerful time to wear it is during a Full Moon. Moonstone offers protection for Cancer's sensitive nature while enhancing intuition, feminine energies and psychic abilities. Considered a stone of inner growth and spiritual perception, Moonstone is an excellent ally during meditation. Additionally, Moonstone brings success in both love and business. Handmade in Sterling Silver (.925). 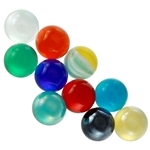 Holds Itty Bitty (10mm) marbles. 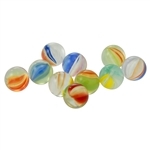 Comes in our white GAYM box with a bag of Itty Bitty (10mm) marbles, a polishing cloth and instructions. The first photo features the pendant with our Itty Bitty Glass moonstone marble. It will be included with the pendant. 1" height, 1" width at widest part. Sterling Silver, .925, Holds 10mm Marbles.